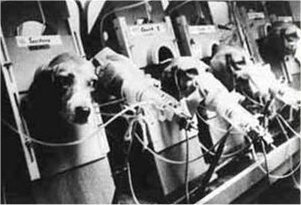 Let's begin by you explaining to us the origins of ALF, its beginnings, who 'founded' it, etc..
Could you explain to us the process of vivisection and illuminate to us what type of animals they force this utter cruelty upon? How can they possibly justify its use? The author Savitri Devi stated that if mankind needed to do medical experimentation they should do it exclusively on themselves. Your opinion? No. 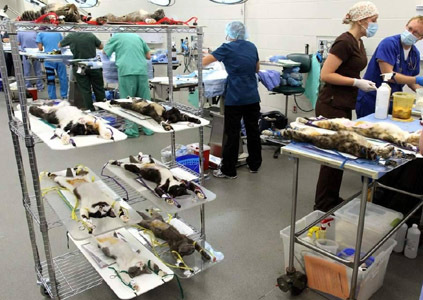 Some say that worldwide 22 animals die every second in labs. There are many estimates of tests done, typically estimates in only one country, or for only one reason. 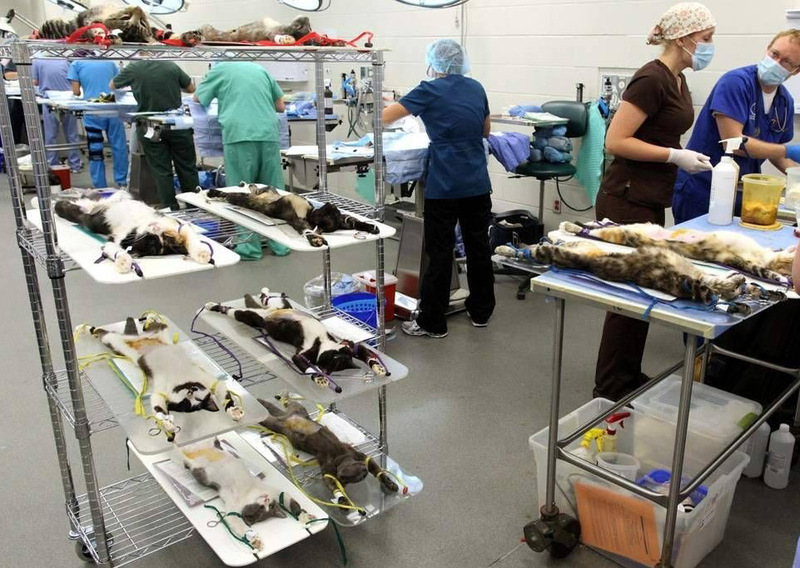 For example it is estimated that six million vertebrate animals are dissected yearly in US High Schools alone. There is a mountain of absolutely deplorable videos on the internet depicting slaughterhouses and breeding farms. 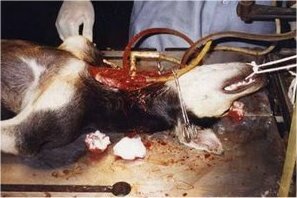 Scenes of men beating or torturing animals before butchering them. Horrible conditions where animals like chickens don't even have space to move their cages are so small. Some are packed three or four a cage, tightly pressed against one another, their beaks cut off so they can't peck their cell-mates. Or animals so sick and weak they cannot walk up the ramp to be slaughtered, so humans with electrical rods shock them where they lay, or even drive forklifts into them. These examples are only the tip of the iceberg. Can you tell us about any images like this that have stuck in your mind? After watching the movie "Earthlings", and having most of it burn into my mind, I no longer watch other videos to remind me of the cruelty of factory farms. Is there a country in this world that bans using animals for research? Which countries would you say are the friendliest to animals? And which are the least? The UK banned using animals to test household products. I am uncertain how to rate "friendliest"? The poorest countries eat the least meat (but it is not a moral decision). India, especially Hindus, may have the most compassion for animals as beings. England may have the most animal rights activists. Italy passed laws giving companion animals some rights - a dog must be walked daily, etc. Germany was the first country to place animal rights into its constitution. New Zealand just banned exotic animals in circuses, Bolivia banned animals from travelling circuses, and Brazil banned animal circuses. Some European countries banned seal fur. Today there are animals rights activists in most countries, including China and Japan. As a result there is more awareness of animals as sentient beings, and consequently more laws to protect animals every month. One of the most despicable videos I've seen is one that takes place on the shores of Japan. Fisherman have herded 100's of dolphins into the shallows of a bay where they beach them and slaughter them. The whole bay is red with blood and the air filled with their screams. Dolphins are said to be one of the smartest mammals in the animal kingdom, they've even been known to rescue humans, defending them against shark attacks in some cases. Your thoughts on all of this? Speaking of Japan, a country so full of culture and codes of honor and etiquette, yet they are notorious for hunting and fishing endangered marine life. With that said, is ALF in Japan? Surely there must be Japanese who are against these kinds of vile acts. Any information you could share? Kora is now in a safe home. ALF receives a lot of negative media attention. There's no shortage of footage on youtube.com, for example, of news casts depicting raided research labs or burned or destroyed property of those that harm animals. Do you feel that these acts of defiance help your cause? Is ALF primarily action oriented or do its adherents also involve themselves in changing government laws? Many activists are involved in political lobbying, but not while wearing an ALF hat. There are no organized ALF actions except at the "cell" level, and these are underground. 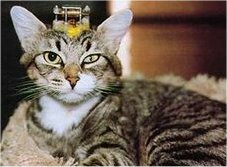 With the amount of money that is generated through testing on animals, such as pharmaceuticals and cosmetics, it would seem that things aren't going to change anytime soon. However, if more people learned the truth about these evils, maybe the animals still have a chance. Yet, sadly, many humans simply don't care enough to speak out. They are too selfish and desensitized. What do you think it would take to truly change things and get people to act in unison? Do you think if some of these atrocious videos were broadcast on international television, uncensored, for all the world to see, it would change anything? Like other social movements a "critical mass" must be achieved before laws are changed. Twenty years ago, there was only one person per 100,000 with any concern for animal rights beyond that of their family pet. That percentage increased exponentially and it is still growing. When enough people realize that the pig they eat is as sentient and loving of life as their dog they will be less likely to tolerate pigs being killed for food. Is it true that the government considers ALF terrorists? Exactly what governments consider ALF this? How do they classify destruction of property, trespassing, etc., as terrorism? 1. In this case it creates more "terrorists" who get their idea of The ALF from the news, and that idea includes using violence towards sentient beings -- which is not a concept of the ALF. And people who think they represent the ALF do direct actions described by the media. 2. When the media creates an animal rights controversy to generate a story with tension, people who would not have heard about it become curious about AR. Often, even if they hate the AR groups or ARAs, many will embrace the principles. This dynamic has repeated itself many times in the history of social movements (such as Malcolm X and such as the violent Vietnam War protestors). 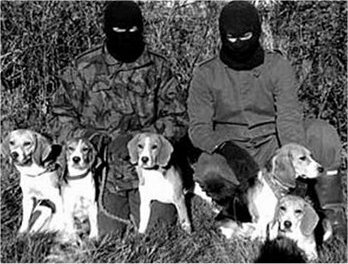 The video of ALF freeing beagles from a research facility is perhaps the most moving and powerful. 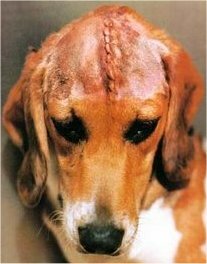 There is other footage, of the same dogs I believe, being abused physically by lab workers. I read that this breed is often used as a test subject due to its docile, passive and generally friendly nature. It was a great moment seeing them under a blue sky basking in freedom with their liberators. Your thoughts? Yes, you have touched the heart of the reason for most animal liberations. Despite talk of ending animal abuse globally, most animal liberations are accomplished by the person who has a personal link to the animal they are liberating. Looking into the eyes of the animal is all the reward that is needed. Lastly, how do you imagine ALF will be viewed, say, a century from now? Will humanity ever lose its callous selfishness and learn to live in harmony with other creatures on this planet?